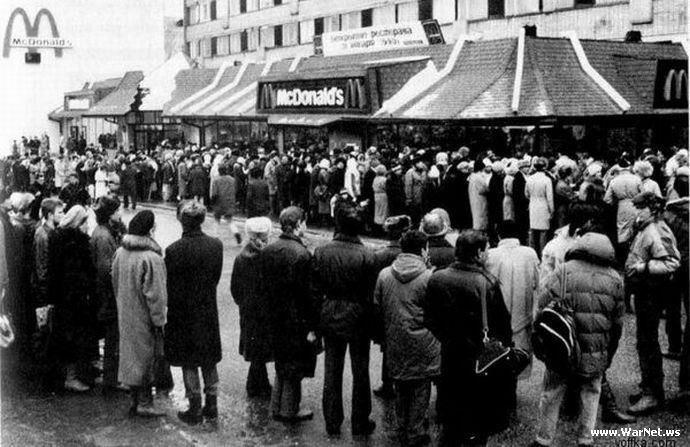 Has it really been 20 years since McDonald's made its way to Moscow? I remember hearing stories of the joy and happiness many Muscovites experienced on that day in 1990. I just listened to an interview given by a women who was there for the grand opening. She said she remembers the smiles of the workers more than anything else. As thousands of patrons poured into the restaurant to order the delicious fat-laden goodness, the workers kept right on welcoming everyone with a smile. This woman mentioned that she thought the workers were laughing at her and could not get over how they kept cleaning everything. Turns out the good people of McDonald's, who certainly know a thing or two about customer service, had spent a tremendous amount of time training their workers to be great hosts. Any prior experience in the Soviet service industry would automatically exclude you from the hiring process. That pretty much sums up the Soviet experiment doesn't it? McDonald's, which had an amazing 2009, (can you say inferior goods? ), recently announced that it will be opening 45 restaurants in Russia this year, adding to the stable of 245 restaurants already operating in that country. McDonald's Russia today is quite a bit different from McDonald's Russia circa 1990 as more and more businesses are contributing to the making of those gut-busting grease bombs. How do you say "Super Size" in Russian?